In these famous remains of the bog bodies, the hair cascades in wild tuffs. There's a personality that comes through in the hair. Was this person a rock star or just a busy author who never brushed her hair? What we do know is that this person was probably not a redhead. 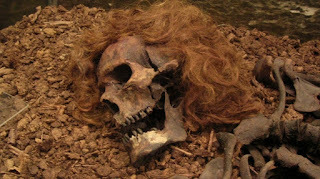 While stolen skulls, jarred hearts, and saved bones seem to all look similar, there is something singular about hair. Maybe it is the indestructible nature of those strands of keratin to withstand the decomposition that flesh cannot. Maybe it is because we remember our loved ones by the halo of hair that surrounds their face. In 2015, I had my own pained relationship with hair while writing my latest book. As anyone who has ever experienced sudden hair loss from a chemo drug will tell you, the day it falls out….you are not prepared. The day it happened to me was any other day. I was rushing around trying to get the kids off to school and putting my hair into my usual no fuss ponytail. When I began to pull the hair back, a large clump came out in my hand. Over the next several months, more strands fell to the bathroom floor. This was my blonde doppelganger. follows the adventures of famous body parts in history. (4) Rachlin, Harvey, Lucy's Bones, Sacred Stones, & Einstein's Brain : the Remarkable Stories Behind the Great Objects and Artifacts of History, From Antiquity to the Modern Era, Lanham : Garrett County Press, 2013.